The “wonderland” that is the Imperial War Museum (IWM) at Duxford, Cambridge, UK, is world renown. Duxford’s Norman Foster-designed American Air Museum (AAM) celebrates the vital part the U.S. played and the lives lost in the progress towards the Allies victory in Europe during World War II. One of the largest exhibits in the glass-fronted AAM is the B-17G Flying Fortress marked 42-31983, named Mary Alice. A longtime exhibit at Duxford, the B-17 was in desperate need of restoration due to corrosion and popped rivets, work that couldn’t be done in the AAM because of noise and disruption to museum visitors. It was always thought that the AAM’s glass front would be raised to allow ingress and egress of exhibits, but earlier this year, IWM staff concluded that removing the glass front would be prohibitively expensive. So they got out their tape measures to see if Mary Alice could be “extracted,” almost Alice in Wonderland style, through double doors measuring 9 feet 4 inches wide. IWM volunteers and staff under the leadership of IWM Conservation Manager Chris Knapp established that with wings removed at the roots, Mary Alice was 9 feet 2 inches wide. It was restoration project “go.” With the panels off, flying controls removed, props and engines off and outer wings removed, the fuselage was mounted on specially made trolleys. 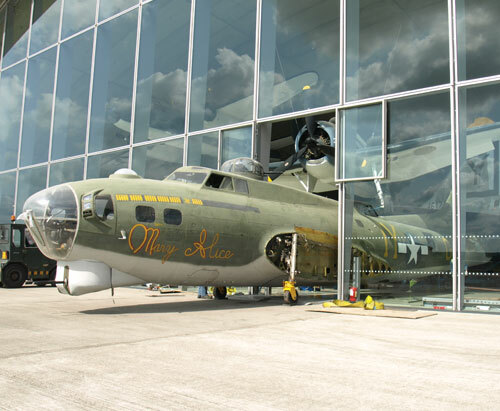 Mary Alice was then extracted through the narrow doors during May 2011, transported across the airfield to the Hangar 5 conservation building, where the 12 months work schedule is well under way—progress on which the public can view. By the end of 2012, Mary Alice will retrace its steps and be back on display in the AAM, although possibly in a different color scheme. In 2014, it is planned to refurbish the whole AAM, and the large, curved, south-facing front window will be taken down. The B-17 work couldn’t wait until then, and it will then be structurally sound, bright-eyed and bushy-tailed, another Alice in Wonderland adventure over. The B-17G is actually 44-83735 that was civilianized postwar at Oakland, California, with Transocean Air Lines Inc. NL68269. It moved to Leeward Aeronautical of Fort Wayne, Indiana, in November 1951, but between 1952 and 1975, was F-BDRS part of the fleet of France’s Institut Geographique National based at Creil near Paris (as was Duxford’s other B-17 Sally B), before being preserved in the AAM in 2002. The original Mary Alice served at Deenethorpe, Lincs, in the UK with the 615th Bomb Squadron of the 401st Bomber Group.